Prepare your applique pieces with no raw edges—precisely apply starch to the seam allowance of your piece. The starch will keep the pressed edge crisply in place. 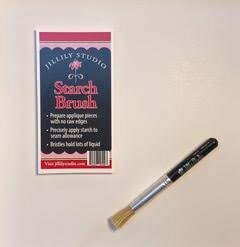 This style of the brush with tightly packed bristles will hold a lot of liquid, for easy and efficient applique prep.